From this gifted mother-daughter team of Francine Rivers and Shannon Rivers Coibion come the Bible stories you'll want to share with the growing kids in your life. Meet thirty important people from the Old and New testaments--some of them famous Bible figures like Abraham and Paul, and others unsung heroes like Amos and Priscilla. The stories will capture kids' hearts and minds, and the "Growing Time" sections will help them apply the lessons of each story so they can live for God today! Perfect for ages kids 6 to 10. Includes an introduction by Francine for adults and a letter from Shannon to young readers. Discussion points help readers discover the importance of following the positive role models and not following the negative ones. Scripture index included. Bible Stories For Growing Kids - Audiobook by Francine Rivers was published by Oasis Audio in February 2013 and is our 21930th best seller. 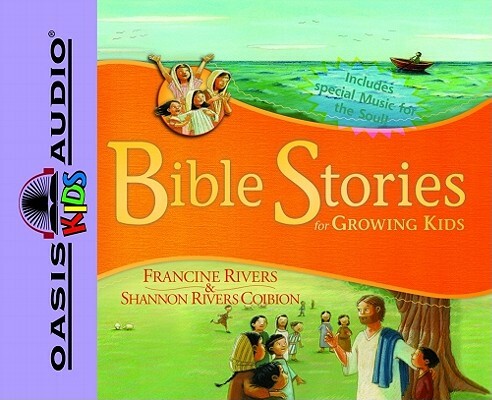 The ISBN for Bible Stories For Growing Kids - Audiobook is 9781598593006. Be the first to review Bible Stories For Growing Kids - Audiobook! Got a question? No problem! Just click here to ask us about Bible Stories For Growing Kids - Audiobook.